A – Anguilla is an island of prominence: The first (northernmost) island in the Leeward Island archipelago, located only 18 minutes north of St. Maarten (SXM) by sea or 7 minutes by air; alphabetically, the first of the Caribbean islands; and first in myriad global awards ranging from best villas, best beach bars, best restaurants and, of course, best beaches. 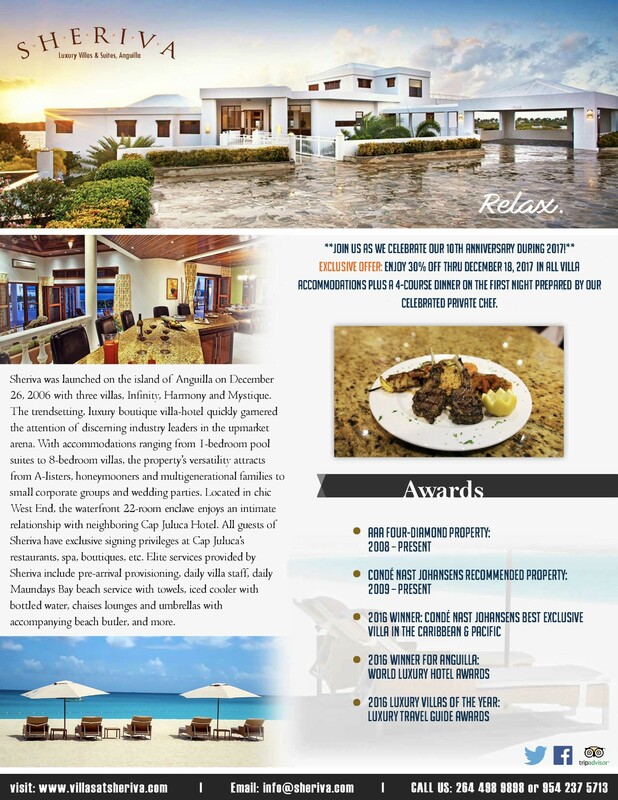 Sheriva is Anguilla’s first award-winning boutique luxury villa-hotel! B – Boat racing: Anguilla’s national sport is enthusiastically enjoyed several times a year around the island. The biggest boat racing day happens on August Monday, the first Monday of August. On this day, locals and visitors alike gather for a day of fun and food in Sandy Ground, culminating with an extravagant beach party where guest artistes perform to a happy crowd of revelers. C – Currency: The official currency is the Eastern Caribbean (EC) dollar, but US dollars are accepted island-wide. The exchange rate is approximately EC$2.70 to US$1.00. D – Dining: Eating on Anguilla is not just for nutrition, it’s an art form. From gourmand experiences to funky beach grills, roadside food trucks and popular “lolos”, Anguilla is a food lover’s paradise. At Sheriva, we also offer exclusive private chef service on request and provide scrumptious menus to suit every palate. E – Electricity: We use 110 volt electricity, just as in the United States. G – Getting here: Our most popular arrival route is via St. Maarten (SXM) from the US, Canada, Europe and Central/South America and then a quick boat ride or flight to Anguilla. Most major airlines such as Jet Blue, US Air, American, KLM, Air France, Copa, Delta, etc. fly into St. Maarten regularly. Other options include flying from San Juan, Puerto Rico (SJU) or other islands to Anguilla via smaller air carriers such as Anguilla Air Express and Liat. H – Hospital: Hopefully, you’ll never need to use this info, but the Princess Alexandra General Hospital is located in our capital, The Valley. Hughes Medical Center, which is closer to the tourism hub of Anguilla, is a state-of-the-art facility open on weekdays. Walk-ins are welcome at both locations. Atlantic Star Medical Center is another great option. I – Idyllic: Anguilla is truly a blissful getaway for those who appreciate the finest things in life. J – Jet Directly to Anguilla: Anguilla’s Clayton J. Lloyd International Airport is small by most airports’ standards with a runway length of 5,461 feet, width of 98 feet and 4,968 feet of landing distance available, but the compact facility accommodates large private jets to comfortably land on Anguilla. Why not skip the extra leg and jet directly to Anguilla? K – Kabukalli. This is the name of one of several exotic hardwoods that adorn Sheriva’s quaint spaces, provided by Anguilla’s only hardwood company, South American Lumber. M – Maundays Bay Beach: This is the beach that dreams are made of. Award-winning Maundays Bay beach is sublime is every way and is only a 2-minute jaunt from your villa at Sheriva by provided golf cart. Beach chairs, umbrellas plus plush beach towels and iced cooler are also set up daily for all Sheriva guests by our very own beach attendants. N – Newspaper: Anguilla’s weekly newspaper, aptly called The Anguillian, highlights weekly happenings both locally and abroad. Printed on Wednesdays, it is available from Thursday afternoons at many locations around the island such as supermarkets, gas stations, etc. O – Oasis: Sheriva has often been described as “the oasis in West End”. Very few properties offer this much privacy on Anguilla. Lush gardens, expansive pool decks, a discreet and welcoming staff, and posh accommodations make this the ultimate Caribbean escape you’ve been craving for. P – Pharmacies: Paramount Pharmacy and Sun Eel Pharmacy are both located on the Water Swamp road. Other locations include the Princess Alexandra Hospital and Hughes Medical Center. Also visit other local stores that carry OTC health and wellness products. Q – Quality Time: Enjoying quality time with family and friends is why you come to Sheriva, and Anguilla. Our spacious accommodations afford for snuggling, laughing, working out, chatting, relaxing and many other delightful activities. R – Religion: Anguilla is a very religious island. Myriad houses of worship around the island are open on Sunday mornings (some on Saturday). Mostly only tourism-oriented businesses open on Sundays. The prominent denominations are Methodist, Anglican, Seventh Day Adventist and Pentecostal/Non-denominational churches. A large number of Roman Catholics worship at Anguilla’s only Catholic church in The Valley. Feel free to worship with any congregation. All are welcome! S – Sheridan Smith: Sheriva’s multifaceted CEO is a revered Anguillian who wears many hats: entrepreneur, architect, engineer, building contractor (built Sheriva from the ground up! ), political activist, mathematician and avid gardener. If you’re lucky, you’ll meet him while staying at Sheriva! V – Views: There is no better place to appreciate the awe-inspiring views of the Caribbean Sea and the verdant coastline of St. Martin, and other islands like Saba and Statia, than from your pool deck or rooftop patio at Sheriva. Y – Yoga: Just one of the many private in-villa services your Concierge Privé at Sheriva will happily arrange for you. Other personalized fitness or spa sessions that can be arranged include massages, facials, mani-pedis, gentlemen haircuts, spinning, tennis, aquaerobics and more. Z – Zeal: The staff at Sheriva is genuinely zealous about serving you every day with a smile. Come join us and be transformed by the exquisite difference at Sheriva. We look forward to welcoming you soon!